Earlier in the month we reported that members of the Torchwood: Miracle Day" cast and crew would be appearing as this year's San Diego Comic Con, courtesy of Starz. Today, BBC America have announced that Doctor Who will also be represented, with Matt Smith and Karen Gillan making their first appearance at such an event. 12:30 – 1:30 pm, BBC America’s Doctor Who – Stars Matt Smith and Karen Gillan make their first Comic-Con appearance for a panel and Q&A with Doctor Who writer Toby Whithouse (Being Human creator) and executive producers Piers Wenger and Beth Willis. They’re bringing with them exclusive new footage from the new episodes airing later this summer on BBC AMERICA. Doctor Who follows the adventures of the Doctor, the mysterious traveler who journeys throughout all of time and space, picking up companions along the way and almost always sidestepping danger. Doctor Who, from award winning lead writer and executive producer Steven Moffat, stars BAFTA nominee Matt Smith as the Doctor and Karen Gillan as his companion Amy Pond, along with Arthur Darvill as Rory and Alex Kingston who plays River Song. Part One of the new season, which premiered in April, delivered record ratings for BBC AMERICA and marked the first time Doctor Who filmed on American soil. Its finale ended with the unveiling of a massive secret and the words "Let’s Kill Hitler" on screen. Part One of Doctor Who arrives on Blu-ray/DVD on July 19 and Part Two premieres late summer on BBC AMERICA’s Supernatural Saturdays. A new book celebrating the Eighth Doctor's adventures on audio is to be published later this year, to tie in with the next series from Big Finish this Autumn. The book is by Will Brooks and Nick Mellish, and will be published by Pageturner Publishing. For a Doctor that only made one TV appearance, in the 1996 TV Movie, the Eighth Doctor has lead a long and eventful life on audio. Since 2001, Big Finish have produced more than sixty audio plays featuring Paul McGann giving the character a life beyond the small screen. In Memoirs of an Edwardian Adventurer, two dedicated Doctor Who fans set out to listen to each of these audio plays, one episode a day every day, in an attempt to experience a true ‘Eighth Doctor Era’. Along the way they discover the highs and lows of the series, from 2001’s Storm Warning through to 2011’s To the Death, via a short series of Sixth Doctor plays featuring ongoing companion Charley Pollard. Written by Will Brooks (Doctor Who: Adventures in Time and Space) and Nick Mellish (Nick’s Little Bit of Net), sometimes examining the literary origins of the Eighth Doctor’s adventures, sometimes commenting on the strength of a story, and sometimes merely praising (or otherwise) a particular cast member, Memoirs of an Edwardian Adventurer is the definitive account of two fan’s experiences of the Eighth Doctor’s travels in time and space. The book also features a foreward by Conrad Westmaas, audio companion C'rizz to the Eighth Doctor from The Creed of the Kroman to Absolution. Memoirs of an Edwardian Adventurer is due to be published on 10th October and is available for pre-order from the publishers; a version for the Amazon Kindle will be available once the book is released. Everyone who pre-orders before 1st September will have their name printed in the book as a special thanks. The BBC have now updated their programme information for Week 29 with details of Torchwood: Miracle Day's second episode, Rendition, which will premiere in the UK on BBC1/BBC1HD at 9:00pm, 21st July. As the Torchwood team is reunited, Jack realises he's the most vulnerable man on Earth; and a flight to the USA turns into a desperate battle for survival. This week sees a few Doctor Who inspired t-shirts available to purchase online, and a number of retailers have kindly offered Doctor Who News readers a discount code when ordering their design! Qwertee have launched the latest in their popular Doctor Who designs; created by "zerobriant" and "rtofirefly", the t-shirt is only available for two days. The 'My Regeneration Tour' is live on stage! Fresh from their last performance at Satellite 5, The WHOs are the greatest band of all -Time-! Paul McGann's sonic screams wail out across the universe, accompanied by killer licks from Tom Baker on lead guitar, and a smooth groove from the bass guitardis of Matt Smith! And you can expect David Tennant to EX-TER-MI-NATE his drum solo with the precision of a Doctor. Doctor Who News readers may claim a 40p/50¢ discount off the t-shirt by using the code doctorwhonews.net when ordering. Other Tees are currently running a t-shirt design based upon the Beatles' iconic Abbey Road; designed by "NanaLArt", the t-shirt is available for the next four days. I really like The Beatles and I really like Doctor Who. I decided to make an equation full of awesome! I know the Abbey Road theme has been done before but if you haven't put Daleks on a meme then you're not doing it right! Doctor Who News readers may claim 50 cents off the price of the t-shirt by using the code WhoNewsPage when ordering. If you missed the chance to get Procrastinate when this was available as an offer for Doctor Who News before, it is now available to purchase from 604republic, which is a semi-permanent item in their catalogue. This Dalek has decided to replace his typical cry of “Exterminate” with something a bit more relaxing, after all, the exterminate part can always get done tomorrow. Doctor Who News readers may claim 10% off their order by using the promotional code DOCTORWHONEWS at checkout. Sharksplode have released a design by Joel Watson based on an idea by Star Trek: The Next Generation actor Wil Wheaton, entitled "Fighting Time Lords". It is both timey-wimey and spacey-wacey. The Scarlets are hosting BBC Cymru Wales's Roadshow on Sunday 3rd July, which will feature a dedicated Doctor Who section amongst the various activities taking place. The TARDIS will be present, plus stands presenting the makeup and costumes on the show, plus the chance to see the work that goes into creating a Doctor Who monster; there will also be the opportunity to play The Adventure Games online. The event is free to enter, and takes place at the Delme Thomas Centre, Parc y Scarlets in Llanelli between 10:00am and 4:30pm. 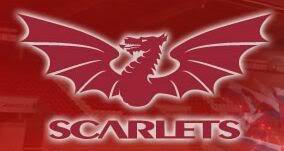 See the Scarlets and BBC Wales websites for full details. The BBC have now updated their programme information for Week 28 with details of Torchwood: Miracle Day's first episode, The New World, which will premiere in the UK on BBC1/BBC1HD at 9:00pm, 14th July. With all the extra people, resources are finite. It’s said that in four month's time, the human race will cease to be viable. But this can’t be a natural event – someone’s got to be behind it. It’s a race against time as CIA agent Rex Matheson investigates a global conspiracy. The answers lie within an old, secret British institute. As Rex keeps asking: "What is Torchwood? ", he’s drawn into a world of adventure, and a threat to change what it means to be human ... for ever. Last week, Doctor Who Magazine editor Tom Spilsbury commented on Twitter that there would be slightly different versions of Miracle Day for the US and UK broadcast, adding yesterday that "they haven't started with one 'master version' and cut it for the UK. They've prepared two parallel edits for different markets." Russell T Davies had previously mentioned in his interview with Front Row that Jack is a 'childrens hero', and clarifies in the new Issue 436 of DWM that 'racier' scenes might be edited for a BBC audience. Attendees at last week's BFI preview had reported that The New World seemed longer than the fifty minutes originally reported in the Cannes press release; this is also confirmed in DWM, with UK episodes expected to run for some 54 minutes whereas episodes on Starz would run for 50-51 minutes. Davies pointed out that this isn't a cut to the US version, but extra material added to the UK one! Once you got to know Nick, you loved everything about him. We were a double act. I loved everything he did. I would have loved him as Othello. All other critical faculties were abandoned. You just couldn’t explain yourself. It was almost like someone saying, ‘What an Earth do you see in her?’ or ‘What on Earth do you see in him?’ Once you actually love someone, you just love being with them – and I loved being with Nick. Saluting the Brig - Nicholas Pegg sets the scene as friends and colleagues remember the life and times of Nicholas Courtney. The tributes include contributions from Frazer Hines, Wendy Padbury, Peter Purves, John Levene, Richard Franklin, Katy Manning, Russell T Davies, Derrick Sherwin, Terrance Dicks, Philip Hinchcliffe, Graeme Harper and many more. Nicholas Courtney - A Life In Acting - DWM looks back at Nick’s long career, from his early days in rep through to his most famous role as Lethbridge-Stewart in Doctor Who and The Sarah Jane Adventures. Seventh Heaven - It was the season in which the Brig came into his own – the Third Doctor’s first series from 1970. DWM looks back to discover what made the season so special as Countdown to 50 continues. Game On! - The Time Team continues its mission to watch every episode of Doctor Who in order, and visit the year 200,000 – but what will Chris, Emma, Michael and Will make of the Ninth Doctor adventure, The Long Game? Splended Chap... - An ancient power makes an unexpected return from the depths of the void and discovers a world very different to the one it left some time ago... Whatever you do, don’t miss Production Notes! Wotcha, Brig! - The Watcher dons his eyepatch and reveals some of the surprising lesser-known facts about everyone’s favourite UNIT commander in Wotcha! PLUS! All the latest official news, reviews of TV and merchandise reviews, previews, competitions, a prize-winning crossword and much, much more! Doctor Who Magazine is available from all good newsagents and supermarkets from Thursday 30th June. Matt Smith and David Tennant have been nominated for "Best Actor" in the 2011 TV Choice Awards shortlist. Both will face competition from Colin Morgan and Benedict Cumberbatch. For Best Actress, Karen Gillan and the late Elisabeth Sladen are nominated alongside Amanda Burton and Vicky McClure. Also nominated is the show itself for "Best Family Drama", where it is up against Casualty, Merlin and Waterloo Road. Steven Moffat's and Mark Gatiss' Sherlock has been nominated for "Best New Drama" along with Single Father, starring David Tennant, and Downton Abbey starring Hugh Bonneville. Toby Whithouse's Being Human, starring Russell Tovey and Lenora Crichlow, has been nomiated for "Best Drama Series". Visit the Awards voting website to cast your votes. Voting on the shortlist will remain open until midnight (BST) on Friday 8 July. The winners will be announced on 13 September. The BBC broadcast the first UK teaser for Torchwood: Miracle Day this evening, between The One Show and Eastenders; the ten second trailer reported that the show would be "Coming Soon". Update 29th June: The BBC broadcast the teaser before The Apprentice at 9:00pm, this time confirming 14th July as the airdate to viewers. After enormous public demand, the organisers of the interactive theatre project The Crash of the Elysium at the Manchester International Festival have announced that a number of tickets will be made available enabling adults to enjoy the experience as well as children. The After Dark performances will run at various times between 8:00-9:00pm from 8th-15th July, and are only open to adults and children over thirteen years old. The Crash of the Elysium will take place at the BBC's new MediaCity UK building at Salford Quays, and is performed by Punchdrunk in association with BBC Worldwide. The experience is written by Punchdrunk's Felix Barrett and Doctor Who writer Tom MacRae, based on an original idea by Steven Moffat. Tickets (£25) will go on sale exclusively via Ticketmaster from tomorrow (Wednesday) at 10:00am. 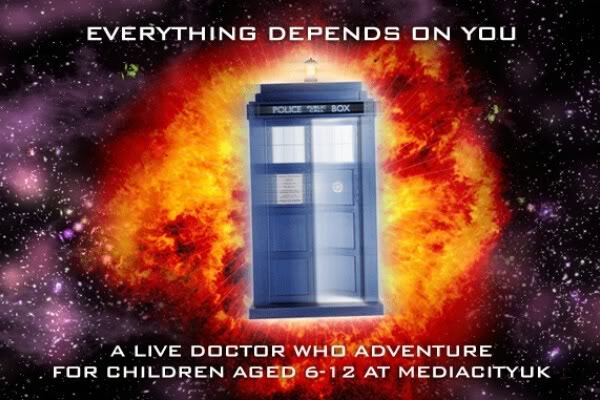 In the tradition of the best Doctor Who the premise of what needs to happen is clearly outlined in the first couple of scenes, where it’s established what’s going on and what the kids have to do. They then go on a mission that requires them to head into this labyrinth of wonder we’ve created. It’s not like The Crystal Maze - if they want to interrogate the adults they meet we have, over months of careful planning, created a watertight story about what’s going on. But the instruction to the actors is - here’s the information, if the kids ask you questions you’ve got everything you need. If all they want to do is press the buttons let them do that! We are told that in 1888 there was a famous steam-ship called the Elysium that mysteriously disappeared at sea. There are conflicting reports as to whether there was bad weather or not. Some legends have grown up around its missing cargo - there was supposed to be this secret Government package on board which has never been recovered. Whether that has anything to do with our show, I don’t know - it’s just a bit of history. The premise is… that you’re going to have the most amazing time of your life...! The BBC Press Office have informed us today that Torchwood: Miracle Day will most likely premiere on BBC1(HD) on Thursday 14th July at 9:00pm. 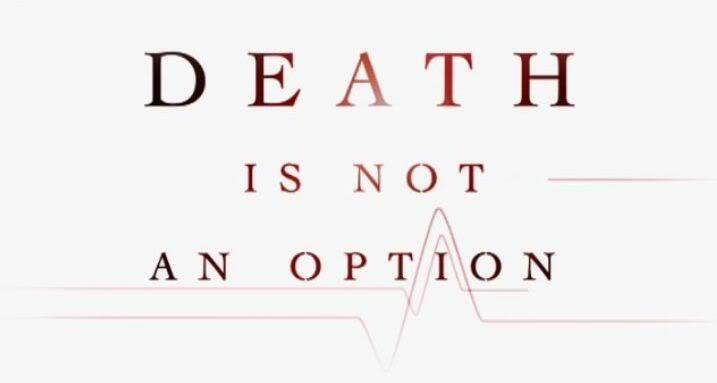 The announcement ends months of speculation over when the show would be broadcast in the United Kingdom, with Starz announcing Friday 8th July for Miracle Day back in March. Canada and Australia see the show a day later, with SPACE broadcasting at 9:00pm(ET) and UKTV 9:30pm on Saturdays. A full BBC Press Release confirming the date and time is expected in the next couple of days. The National Space Centre in Leicester is to once again celebrate Doctor Who this coming weekend (2nd-3rd July); Time and Space will see a weekend of activities organised by the Hyde Fundraisers, with proceeds going towards BBC Children In Need, Comic Relief and other charities. Two guests are expected over the weekend: Saturday sees third Doctor companion Jo Jones née Grant - aka Katy Manning - drop in, whilst Sunday will be invaded by Dalek creator Davros in the form of Terry Molloy. Costumes created by the group will be on display, including Ood Sigma, Roboform Santa, Sec Hybrid, and a Clockwork Robot; this will be accompanied by Behind the Monsters, a presentation on how the costumes are created. There is also the opportunity to have photos taken against the group's virtual greenscreen, plus a special presentation about their show, The Trial of Davros. For full details visit the NSC and Hyde Fundraisers websites. Looking ahead, the Hyde Fundraisers are planning a special event on the 17th September: Elisabeth Sladen: A Celebration is to take place at the Ashton-under-Lyne Cineworld, with showings of School Reunion and selected Sarah Jane Adventures, plus invited guests. Proceeds will go towards Children in Need - see the group's webpage for the latest information.